Are Lupins Right for my Garden? Lupins from Seed or Plants? Lupins are perennial (i.e. they come up year after year) shrubs which start into growth after the last frosts, produce their first flush of flowers in late May / June and can continue flowering into early August if dead-headed correctly (see below). The flowers are large and very showy, in almost every possible colour imaginable including some unusual shades of blue. When grown from seed they are an extremely cheap and reliable plant for the cottage garden. Note that this article only covers perennial lupins, there are annual lupins but these only last one year and are grown in a very different way. Use the checklist below to decide if Lupins are suited to your preferences and garden conditions. They prefer a neutral to slightly acidic soil but are tolerant of most other soils even those poor in nutrients. They will not grow successfully in chalky soils. They prefer a moist, well-drained soil but can be grown in most garden conditions. They do not like being water logged which can rot the crown. Prefer a full sun position although they can be grown successfully in light shade. They grow to a height of 1m to 1.2m (3ft to 4ft) depending on soil and weather conditions. They support themselves, even in windy conditions and do not need staking. They look best either as a group of plants (five or more) or interspersed in a mixed flowering bed. They can suffer badly from aphids (Giant Lupin aphids in particular). They suffer from very few diseases and are generally healthy plants. No particular knowledge is required to grow them. GROW LUPINS FROM SEED OR PLANTS? Lupins can be grown either from seed or from cuttings. The choice of which is the best option comes down to two factors, cost and how determined you are to have to have a specific colour. Lupin seeds cost on average about £2.50 for a pack of 40 and will give you excellent plants which will be a variety of colours. The seeds should be sown in late February indoors to early April. Some of them may well flower in the first year others may only flower in the second year. Lupins grown from cuttings are the only ones which will be an exact replica of the parent plants. They come in two basic ways, either as plug plants or as pot plants, both of which are far more expensive compared to seed however you are guaranteed the variety and colour you require. For pot grown or plug plant lupins our recommended supplier would be Crocus for reliability, quality and price. Click here for their informative page on buying and choosing lupins. The Lupin calendar below has been adjusted for your town, UK. Click here to change towns. The process for sowing saved seed or packet seeds bought from garden centres is normally the same. For the most reliable results sow seeds indoors, however they can also be sown in pots outside a month later. The best time to sow lupin seeds indoors is around the first week of March. The day before sowing, soak the seeds in a saucer of water. This will hydrate the seeds and result in quicker germination. You can sow seed initially is seed modules and then transplant into 8cm / 3in pots when the seedlings have four or more true leaves, normally two to three weeks after sowing. Alternatively sow one or two seeds directly into 8cm / 3in pots, this is the method we prefer. Sow the seed about 1cm deep and sprinkle fine compost on top. Use normal multi-purpose compost and water, but not water-log, the compost immediately after sowing. Lupin seeds will germinate in a wide range of temperatures, the best being about 15°C / 59°F to 20°C / 68°F or somewhere around the temperature of a cool room in a centrally heated house. Seedlings should appear in 10 to 15 days time. When they do emerge, keep the plants in a cool, light position. A windowsill will be fine but not one in direct sunlight. In the last week of April harden off the plants over a week or two, at this point they will be ready to plant outside. Although more expensive compared to seeds, plug plants are still cheaper than buying larger plants in 8cm / 3in pots. Buy the plug plants in late March / early April and then pot them up into 8cm / 3in pots a couple of weeks later. When you can see the roots at the bottom of the pot harden the plants off as described above. 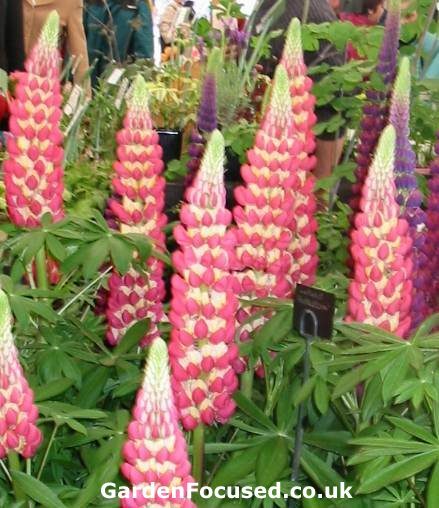 Lupins prefer a full sun position but will also grow well in semi-shade, they do not grow well in full shade. They grow well in a wide variety of soil conditions although chalky and / or waterlogged soil will be a problem if not improved before planting. If the ground is very clayey, lots of grit dug into the planting area will greatly increase their chances of surviving wet winters. Although lupins grow to about 150cm / 5ft high they are surprisingly strong plants even in exposed and windy conditions. 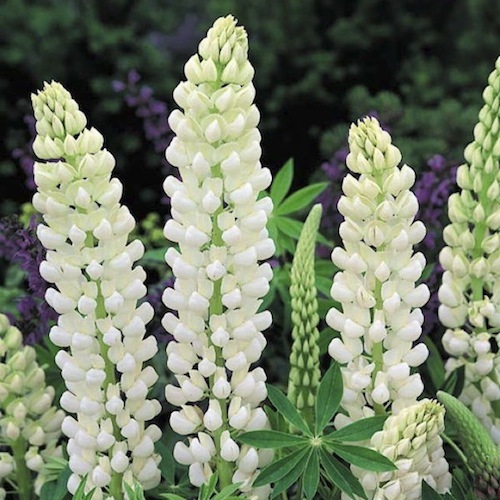 Lupins will grow in all parts of the UK and Ireland, withstanding frosts down to -25°C. Planting lupins is simple, dig the area well where they are to be planted and sprinkle on some blood, fish and bone working it into the soil. Dig a hole for each plant and plant to the same depth as it was in the pot. Lupins grow from crowns and if these are planted too deep they will rot, if planted too shallow they may fail to establish well. Water well. The planting distance between each lupin should be 30cm to 45cm (12in to 18in). Lupins are strong growing perennial plants and quite capable of looking after themselves as far as water and nutrients are concerned. They have long tap roots when established which allows the roots to find water in all but extreme drought. In fact, manual watering may well result in the crowns rotting. The roots can also find their own nutrients, they have nodes on them which produce their own nitrogen. Don't feed lupins after their initial feed at planting time, nitrogen based fertilisers will encourage lush green growth which make them more prone to aphid attack. To get the longest flowering period from your lupins, cut off the flower heads when they have died down. The flowers will die from the base of the flower head upwards, the time to dead head them is when two thirds of the flower has died. New, smaller flowers will soon appear extending the flowering season. As the foliage starts to turn brown and die down in winter there is no need to do anything. The foliage will slowly die back and does no damage. In early spring when new shoots appear, clear away any remaining dead foliage to allow good ventilation at ground level. Lupins will live for 10 years or more but much depends on the the conditions they are grown in. Generally they will produce a good display of flowers for five years and then begin to become woody and unproductive. It is well worth digging them up at this stage, dividing them and replanting. Even though their long tap root will be damaged they may well recover and produce a decent display of flowers for another four or five years. 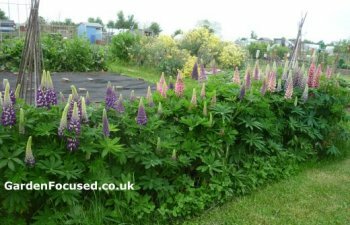 These pests often attack lupins and the unfortunate truth is that these plants are not one for the organic gardener in many cases. In particular the Giant Lupin Aphid may attack your plant and if left to their own devices the result will be poor flowers and foliage which is open to further attacks from fungi. Spray lupins with a systemic insecticide at the very first signs of aphids which is generally May time. Then re-spray the plant two weeks later. Spraying with insecticidal soap and all the other organic solutions will have almost zero effect when aphids attack your lupins, we have tried them all! Some areas of the UK do not have problems with slugs and snails but many do. Again, the only solution which works is not an organic one. The organic slug pellets simply don't work as far as lupins are concerned. Normal slug pellets do work and in our opinion are the only deterrent. Occasionally the base of the plant rots and this is caused by excessive moisture. Dig up the rotted plants, space the remaining ones out a bit more and you may find the problem disappears next year. Lupins will stay the same colour year after year, they do not change. Where you notice a change in colour from one year to the next it is because the plants have self seeded (they are very good at this). The self-seeded plants will, in all likelihood, revert back to a bluer shade each year. The solution is to prevent the plants self-seeding. This can be achieved only by removing the seeds from the flowers before they fall to the ground. One of the key problems with growing lupins in containers is that fully grown plants are 150cm tall and that makes them very top heavy. Only large and heavy pots (at least 60cm / 2ft in diameter) are suitable. Combine this with their need to produce long tap roots for successful growth and you need a wide and deep pot. Certainly it will not be moveable by one person. If you can provide a pot of a suitable size (with a drainage hole in the bottom) the soil should be free-draining (two thirds multi-purpose and one third sharp grit). Other than that the plants will have no special needs compared to other pot plants. Watering will be required frequently and because they prefer slightly acidic conditions, rainwater is preferable compared to tap water. See our article on water butts for convenient ways to collect rainwater. The best plant food is a fortnightly application of liquid tomato feed from April to late June. When the foliage dies down in late winter there is no need to remove it unless you really want to for the sake of appearances. It is best removed in spring when new shoots appear. Allow the seed pods to turn brown then remove them from the plant and open up the pods to get at the seeds. Seeds will be available in July to August time. Store until required in a cool, dry dark place. The seeds will keep for three years or more if stored correctly. The older the seeds the more important it is to soak the seeds before sowing. We strongly suggest that if you are travelling any distance you phone them first on 01237 431111. Visits to the National Collection of Lupins are by appointment only which we feel is rather disappointing. What's the point of a National Collection of plants if they are not open for viewing except by appointment? So, phone first before visiting! Below we list the key strengths and weaknesses of Lupins.